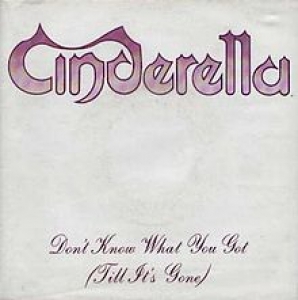 I can officially add “Don’t Know What You Got Till It’s Gone” performed by Cinderella as my favorite take me back song. As I was listening to “Nobody’s Fool”, there was a sidebar of other videos posted by users; I kept clicking on various user videos until I came across this one. like a lullaby: Piano and all. It’s obvious they song didn’t lack the efforts of the guitar, but the piano was a stand out throughout the entire song. I don’t know what it is, but it has that universal beat that makes you want to move your head from side to side, which I find myself doing often. The chorus is also catchy and the verses themselves are worth listening to as well. Overall, “Don’t Know What You Till It’s Gone”, is the perfect song to listen to if you’re trying to get back that person you let slip through your hands. The lyrics are so poetic and true and the piano and guitar are together for this particular song. If you do decide to listen to this song, please read the lyrics as well because they are really good.